For those who are active on Facebook, it is hard to get their attention to involving Twitter. The 140 text character limitation is not user-friendly for some users. After today’s incident, we found a good reason to join Twitter. 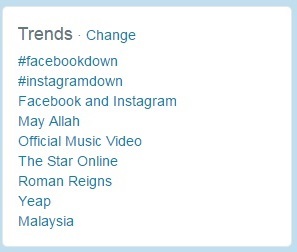 #instagramdown #hastags have become trending tweets. Twitter pick up as mainstream social platform for users to communicate if ever the Facebook and Instagram are down.